Louis Danziger is a great American graphic designer. He started to be interested in graphic design from an early age, browsing Gebrauchsgraphik magazine at the public library when he was only 11 years old. After graduating from the Evander Childs High School, he served the U.S. Army in the South Pacific from 1943 to 1945. Once discharged, he moved to California and attended the Art Center School studying under Alvin Lustig, a pioneer of American graphic design. He graduated in 1948 and became a member of the Design Group, former students of Lustig who “opposed mindless, sentimental, nostalgic, commercial design.” In the same period he started to frequent leading designers based in Los Angeles, such as Charles Eames, Rudolph de Harak, and Saul Bass. In 1949 he founded his own practice, and started working for prominent companies including Flax Artist’s Materials, Fraymart Gallery, General Lighting, and Steelbuilt Inc. Being “disenchanted with the provincialism of Los Angeles,” he soon returned to New York City. In New York he shortly worked in pharmaceutical packaging graphics, and then moved to Esquire magazine. At the same time, he attended New School’s night classes in graphic journalism by Alexey Brodovitch, a pioneer of editorial design. Once completed the course he went west again, this time to study architecture at the newly founded California School of the Arts, where he studied again under Alving Lustig, Edgardo Contini, and Raphael Soriano. His work started to be published and his fame quickly grew. In 1957 he moved to Milan, Italy, where he started working for Studio Boggeri but soon left to collaborate with Alberto Rosselli, the editor of Stile Industria magazine, and Giulio Confalonieri, a prominent Italian graphic designer, on the Industrial Design Section at the Triennale exhibition. After one year he returned to the U.S.A. During his career he served major companies acting as design consultant for Microsoft, the LACMA (Los Angeles County Museum of Art), and the 1984 Los Angeles Olympics. From 1972 on, he gradually increased his teaching activity, started in 1954 with a course in advertising at the Art Center College. Former Director of the graphic design program at the CalArts (California Institute of the Arts) from 1972 to 1988. Over the years, he taught and lectured at a number of prominent design schools in Canada, Japan, and all over the U.S.A. Member of AGI (Alliance Graphique Internationale) since 1974. Honorary Member of STA (Society of Typographic Arts). He received many recognitions including the AIGA Gold Medal in 1998 for “standards of excellence over a lifetime of work.” His work is part of the collection of important museums including the MoMA (Museum of Modern Art), New York. From about the age of 10, I decided that I was going to be a commercial artist. That was the term used for someone who did art for industry as opposed to a fine artist, who hoped to have work exhibited in museums and galleries. I didn’t know the words designer or graphic designer until much later. I began reading books and periodicals and taking classes and, of course, the more I learned the stronger were my convictions and interest. What was your educational path? I went to elementary school then to high school in New York, where I majored in art. After serving in the military, I moved to California and went to the Art Center College of Design, where I studied with Alvin Lustig. He was a major influence. Afterwards, I took an evening course with Alexey Brodovitch at the New School in New York City. You were really young when you first became interested in art. I read about the free classes that you took. What did they consist of? Is there something in particular that caught your attention? I grew up during the depression, and there were a number of federal programs to ease the difficulties. One of these programs was the Federal Art Project. Their art classes turned me into a designer. I remember the first poster design class, Saturdays at the Y on 92nd and Lexington. I learned so much! Did your parents encourage you to pursue this passion? If so, did it come from their jobs or interests? My father was a working man, a carpenter cabinet maker, born in Europe, self educated. Unschooled but very intelligent. He was very interested in culture, especially in theatre and Jewish literature and poetry. We would always go to concerts and plays, which were either free or very inexpensive as they too were part of the federal programs supporting the arts. But neither he or my mother were at all encouraging about me planning to be an artist. He certainly did not want me to work with my hands. To his credit although he did not encourage me he also did not discourage me. It was my decision to make. In elementary school I was fascinated by geography. I had a wonderful teacher who talked about connections and consequences. She would explain, for example, if a country had a lot of rainfall it would result in growth and export of certain products. I was intrigued by this idea of connections, it has remained with me to this day. In High School I was most interested in art and design, but also quite interested in biology and literature. I clearly remember that I always enjoyed going to school. When and how did your career start? During my summer vacations from high school, starting at age 15, I would find summer jobs as an apprentice in various art studios, first at a litho house and then at a silk-screen firm. In 1949, having moved from New York City to Los Angeles, I started a freelance business which became quite successful. During my active career as a designer I also always taught design classes at least one day per week. Today, no designer – at least in Italy – does these practical experiences of apprenticeship during his training. The technology has changed and the graphic design has become less concrete. The lack of this practical component often leads to a lack of awareness of the design process. Of course this sort of apprenticeship training does not exist today: in the digital age the reproduction processes are so highly computerized that a designer simply provides the files to the specialists who fit them properly. The printing industry is largely computerized at every step of the process. Quality control is no longer in the hands of skilled craftsmen as in the past. Another reason why apprenticeships no longer exist is financial. Successful studios no longer have the time to invest in training employees. They find it more advantageous to pay someone who already has some experience than to invest the time and effort in training a new comer. How important were these experiences of apprenticeship during your education? For me the experience was extremely valuable. It gave me an understanding of the printing processes so that I knew exactly what the ultimate production pitfalls were ahead and I could design accordingly. I also experienced at an early age how professionals actually work, how things got done. It was so practical and educational! How has your design evolved since that time? From 1972 on I reduced my design activity and began to teach full time (three days a week) at the newly opened California School of the Arts. I developed and taught one of the first courses in the United States in the History of Graphic Design, which was quite influential in stimulating interest in the subject. I continued to do design work, principally catalogs and posters for the Los Angeles County Museum of Art, but primarily I functioned as an educator and a design consultant to major corporations. Herbert Bayer wished to reduce his involvement as corporate design consultant with Arco, a major oil company, so I was hired as co-consultant. My contract was an exclusive one which did not allow me to work for anyone else, but I could continue to teach and do work for the Museum. It was perfect for me at that time of my life. How did your teaching experience begin? After I left the Art Center College of Design in 1948, I went back to New York City and worked for Esquire Magazine. I found that job very unsatisfying and frustrating. While working there I took an evening class with Alexey Brodovitch at the New School. I learned some important things from Brodovitch, mostly about the importance of authenticity and originality. I told him about my frustrations at Esquire and he encouraged me to leave and I did. He connected me to the photographer Richard Avedon and the designer Robert Cato, who helped me by giving me some freelance work. I was questioning whether I really want to stay with graphic design or would I perhaps be happier in architecture, which I thought played a more positive social role than advertising. That led me to return to Los Angeles to go back to school. 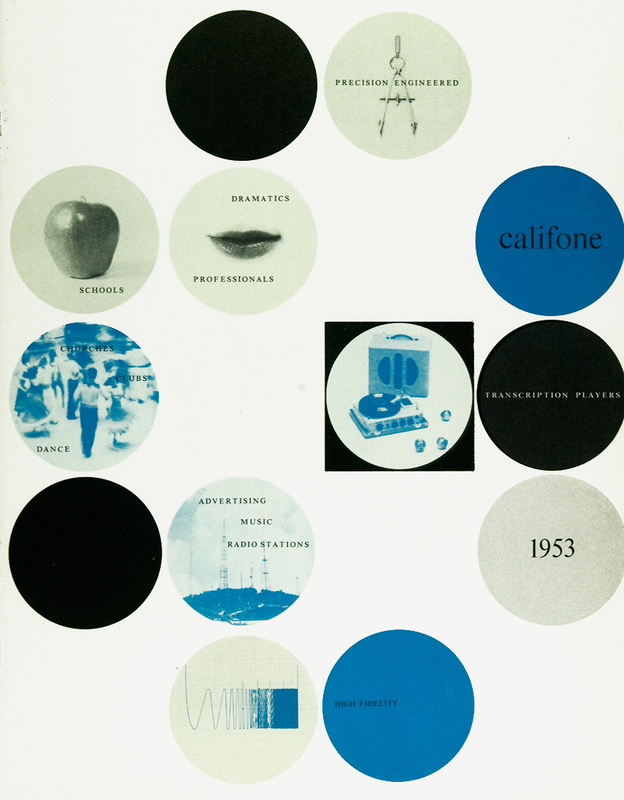 I took Alvin Lustig’s graphic design class and an architecture class with Raphael Soriano at a new school called California School of the Arts. Near the end of the term, Lustig had decided to move to New York and he asked me if I would finish the term in his place. That was the beginning of my teaching career. I loved teaching and apparently I was quite good at it. I was getting very positive feedback and I could see the impact of my teaching on the students work. It was enormously gratifying. The school was short lived and closed its doors so that ended my teaching for a while. I devoted myself primarily to my design business and I was beginning to have successes. My work was being noticed and published in the various international design annuals and I was winning many awards. My reputation was growing up and I was beginning to make a steady income so I married. Around 1954 Art Center College invited me to teach an advertising design class for second year students and I gladly accepted the invitation. After spending almost a year in Europe in 1957 I returned in 1958 and once again went back to teaching that class. What kind of courses did you teach? I have taught at a number of professional design schools, Art Center, Chouinard, California Institute of the Arts. I have lectured and conducted workshops in universities all over the United States, Canada, and Japan. I taught classes at Harvard University during the summers for ten years, a studio class in visual communications and a lecture class in the history of design. My teaching has always been practical rather than theoretical. I principally try to teach my students how to think clearly and to behave in a moral and responsible manner. Since I believe that design is purposeful, there is always a problem to be solved, an objective to achieve. I try to teach them how to find solutions to problems. How to analyze and understand the problem clearly, how to state the problem in different ways in order to find inherent possibilities. The problem is always solved from what you know about the problem, so I push them to understand every aspect of problem, the objective, the audience, etc. The more they know the greater the possibilities. They are then encouraged to explore the possibilities, to develop visual ideas that are appropriate, to explore images related and relevant to the subject. Once a workable visual concept is developed it now moves more in to the realm of form and formal issues. How to present the concept in the most effective and affective way. In the process of teaching all of this one touches on many issues, human behavior, communication, perception, psychology, methodologies. The teaching mostly helps them learn how to think about these things and how to apply this knowledge. This is all accomplished during the critiques and discussion of the assigned projects. I always insist that all of the design decisions must stem from and be in the service of the content. Design is never a an end in itself, but a means to best achieving a desired end. Do you think that the teaching activity has influenced the quality of your design work? Absolutely! I felt that it was important that I teach at least one day per week, because I came to understand that teaching was absolutely the best way to learn. In the process of trying to explain something to students you learn how to clarify your own thoughts. Teaching forces you to confront current issues, to think about what is happening and why. It helps you to understand what is basic and fundamental to doing good work. In trying to explain processes, productive thinking and approaches to the students you come to understand a great deal yourself. I am now 89 and still teaching and I am probably as computer literate as my students. I know no one my age who are as computer literate. How could I, as a teacher, function without that knowledge? Teaching keeps one engaged and looking forward. It is invaluable if one wants to continue growing. I am certain teaching has been a major contributor to what ever design ability I have. I’m interested about your experience in Milan. Were you there for work? Have you met the designers who worked here? At that time, 1957, I was not very content with what was happening in the United States. Consumerism was at its height, the political climate was reactionary and I felt like a misfit even in the design community. All the designers I knew seemed more interested in material success than I was. I wanted to do meaningful work and I seemed to be alone in that. I thought that Europe would be more involved in the world of ideas and because I was so enamored of Italian design I thought I might try to live there. It was my wife and I, we had no children so we left for Europe on the Italian line’s top ship, the Cristoforo Colombo [Note: It was designed by Giulio Minoletti.] (a wonderful way to travel). We were given some names of people who might help us by Leo Lionni and Mildred Constantine, curator of design at MoMA. We arrived in Milan in February of 1957. The people who helped us included Alberto Rosselli, the architect and editor of the magazine Stile Industria. He had earlier included an article on my work in the magazine and the issue of Graphis magazine which also had an article on my work appeared just prior to my arrival in Italy, so apparently I was beginning to build a reputation and was known to the Italian designers. I had met Enrico Peressutti of BBPR at an Aspen, Colorado design conference during the early ‘50s and he was very hospitable. We had dinner at Rosselli’s one evening. They invited a few architects and designers (I can only remember Marco Zanuso, who I immediately liked). My Italian was largely non-existant and their English – except for Rosselli – was just as bad. I had come to Europe for the world of ideas and here were the people I wanted so much to talk with, especially about Italian design, and we could not communicate. What I did discovered in Italy was not the world of ideas but the world of food and creature comforts. In Italy I discovered the pleasures of eating! I’m sure everything has changed by now, but in 1957 Milan the humblest trattoria had wonderful food. We ate regularly at a little place near the Brera [Note: the Milan art district, located in the core of the city, where are based the Brera Academy of Fine Arts and the Brera Art Gallery]. Many artists and writers ate there regularly. It was cheap and delicious, every dish. Then of course we occasionally discovered special restaurants like Pappagallo in Bologna or Fini’s in Modena. Northern Italy was indeed the gastronomic center of the world! And as to creature comforts, even in a second class hotel when I asked the maid for a bath she would prepare a deep hot tub with a huge heated towel. In the U.S.A. we shower, in Italy we luxuriated! In Milan if the phone rang during lunch no one would answer it (only a mad person who one wouldn't want to talk to would call at lunchtime). What a civilized way to live. That was new to me. What I did not like was what I saw as hypocritical behaviour on the part of many Milanese. They seemed so ‘signorili’, polite and considerate when you met them in any personal situation (it almost seemed like an exaggerated politeness) but on the street car they would knock over an old lady to get a seat. Their private behavior and the public behavior was so different. In the United States peoples behavior was more consistent. What you were at home was what you were on the street. For working in Milan I had no specific plans, but I expected to explore the possibilities after we were acclimated and had a better command of language. One evening, shortly after we arrived, Antonio Boggeri heard that we were in Milan and were going to attend a party given by a sculptor named Romano Rui. Boggeri showed up at the party with tear sheets of some of my work which he had cut out of some magazines. I was very flattered particularly as Studio Boggeri did all that wonderful work which I so admired and had drawn me to Italy. He knew my work and wanted to hire me and I happily agreed to try it. I only spent a few weeks there, mostly we discussed some large projects which were forthcoming and which he wanted me to do. As I remember it one was a multi volume history of the Pirelli company and another a large book for a hydro electric plant in Southern Italy. While waiting for that to materialize I designed a few things, mostly promotions for the Studio. I became very friendly with Aldo Calabresi and his wife Elisabeth. Aldo was the principal designer at Studio Boggeri at that time. The Calabreses were Swiss and spoke English very well and Aldo and I would play chess several evenings a week. I left Boggeri because Alberto Rosselli, who was designing the industrial design section of the Triennale, asked me to do the graphic design for that exhibit. I had several meetings on the project with Rosselli, Gillo Dorfles – who was doing the text – and two very young Milanese graphic designers, who were to assist me since I did not know of any of the available suppliers and resources in Milan. One was Giulio Confalonieri and I think the other was his partner and they were at the beginning of their careers. Unfortunately I had to give up the project because I had to go to Switzerland and that was pretty much the end of my stay in Milan. We left and took a small apartment in Lugano, overlooking the lake. I loved Lugano. After a month we decided we better go home to California. Goodbye to Europe. Was your wife also involved in your design activity? I met my wife when she came to my studio looking for a job. She had just come to California from New York, where she grew up and she had worked at an advertising agency there. She did production, that is she prepared the art for reproduction. A job generally referred to as a paste-up artist. She was quite good, very accurate, neat and efficient. I did not hire her, because I worked alone and did all my own production work. I think she was only about 19 or 20 at the time and I liked the way she looked so I sent her to friend, an art director of a small advertising agency art studio and he hired her. I married her about a year or so later and she did come to work with me for about a year or a bit less. She was really not very interested and stopped. She started taking drawing and painting classes, going to a major art school and getting her Bachelor of Arts degree. She had a painting studio for a while and she worked at the Eames Office for a year or so, mostly assisting Ray Eames. She and Ray were very close. She never made anything of a career as she likes the studying but detests all the things that artists need to do to establish themselves. Last year she started (she is now 81) going to school with me on Fridays and while I am in class teaching she attends a drawing class. What about your experience in Japan? I read that you liked Japanese people and culture in 1945. You were really young and you were an American soldier. What attracted you in such a different country? I arrived in Tokyo on the first day of the Japanese surrender. I was a radio operator, communication chief in the headquarters company that oversaw the governance of Tokyo. The city was in rubble, mostly destroyed by wartime bombing. Only here and there a building standing, people in rags, hungry, it was very bad. During the first weeks you seldom saw any Japanese as they hid, frightened of the Americans, but after finding that not only were we not a threat but rather saviors providing food and other aid they began to slowly emerge and we began to make contact. At the time I knew a little about Japanese art, which I admired, and was therefore predisposed to them. I began having lunch with the young girl telephone operators. I would often bring food and treats and though it was difficult to communicate we somehow managed to make progress. They would learn some English and I some Japanese. There were about a dozen girls, probably late teens, no one over 20. What I found so wonderful is that during lunch they would have Haiku [Note: it is a traditional Japanese poem of three lines, respectively made of five, seven, and five syllables] writing contests. Imagine young working girls writing poetry during lunch. In the United States more than likely comparable switchboard operators at lunch would be discussing boys and clothes, certainly not writing poetry. While I was there an exhibition of Bonsai was held at Hibiya Park. I had never seen anything like it before or since. It was amazing. Not only the dwarfed tree but the container housing it, perfect for the tree. Little perfect environments for each amazing miniature. Only the Japanese would lavish such care over so long a time. I had never experienced such an aesthetic culture. I left Japan thinking that I might come back to live there. Which changed did you experience in 1965, when you were back to Japan? In 1965 I returned in order to supervise the printing of the “Art Treasures of Japan” exhibition catalog, which I had designed. Since the exhibition was sponsored by the Emperor of Japan and the President of the United States I had at my disposal the entire ministry of culture and education. We had access to everything, for example we were allowed to tour Katsura Palace, the epitome of Japanese architecture and gardens, by ourselves for ½ and hour. When we first arrived my wife was really thrown back. It was all so shocking, so foreign, so strange. When we went to Europe in 1957 she felt as if she was going home. Her grandmother was Croatian and her grandfather from around Trieste. Neither one spoke much English and since her grandmother played a large role in raising her, she felt comfortable in Europe. So Japan was a surprise and a shock. She very quickly adjusted to the situation and it seemed to me that she was more peaceful and serene in Japan then she was anywhere. I having been there before, had different expectations but everything had changed. There was no sign anywhere that there had been a war. Everything was rebuilt with very large office buildings. The buildings were not too tall but very large in area. You might see a building which was only six stories tall but the size of an entire square city block in New York. I started going to Japan several times a year, usually for several weeks at a time as I began to serve as a consultant to a major advertising agency and advisor to two design schools, one in Tokyo and one in Osaka. Japan had really changed from when I was last there in 1965. Tokyo was full of tall buildings. The Japanese economy was booming and building was going on everywhere. The city was more crowded and busy than it had ever been. Akihabara, a section of Tokyo devoted mostly to the sale of electronic and photographic equipment, was intense with neon and day-glo signs. There was nothing like it anywhere in the world. The visual noise was just fantastic. Osaka too was just full of activity, perhaps a bit more youth centered. It was full of great shops, entertainment clubs and extremely lively at night. Tokyo and Osaka were like cities on steroids. We also went to Kyoto a few times and that too had changed. Not the traditional sites like Katsura or the temples or shrines, but here and there one saw new commercial structures and bits of urban blight that were not present in 1965. You note that you learnt a lot from readings. Do you remember any particular book? I got a great deal from my reading. I had an art and design library of over 5,000 books all of which I read, some several times. Reading was my principal teacher. In many ways books are better than classes. A book is a teacher who is always available, day and night. A teacher you can take with you wherever you like. If you don’t understand something you can read it again and again until you do. In a class you can’t keep asking a teacher to repeat themselves over again and again. The main advantages of the class, where every student works on the same assignment, is the fact that you can see how others solve the same problem. This never happens outside of class (with the exception of occasional design competitions). There are two books in particular that had a profound influence on my work. Charles Eames was an admirer of Buckminster Fuller, sometime probably around 1949 he gave me a copy of Fuller’s first book “Nine Chains to the Moon”. It was a mind opener. To this day much of Fuller’s thinking plays a role in my design thinking. The other book was Paul Rand’s first book “Thoughts on Design”. Much of what he wrote about symbols and their ability to encapsulate ideas was what I was thinking about but could never articulate. He clarified a lot for me. I also learned so much simply by studying and analyzing his work that he showed in the book. I tried to deconstruct his thinking, why did he do what he did, what led him to a particular design decision. It was a very active way of looking at the work and extremely educational. Do you continue to read so much also today? Yes, I am always reading but nowadays not much in the design field. Because I continue to teach, I try to stay current by looking at some design periodicals but I don’t find too much of interest. On the one level I find contemporary work often dazzling visually. There is so much rich, imaginative and formally strong work. The eye is satiated but there is so little work that touches the mind. Every once and a while I come across an interesting article but so much design writing today is like the art-speak of art criticism and is of no interest to me. Which is the project you remember with more pleasure interest? I generally find that there is almost always something about every project that gives me satisfaction. I probably most prefer working on museum exhibition catalogs, but complete advertising campaigns as opposed to single advertisements are also satisfying. Having done so much work it is impossible to select any one for special attention, but I do like the catalogs I designed for the Russian Avant Garde an the Art and Technology exhibitions at the Los Angeles County Museum of Art. What would you like to design today? Probably some campaign dealing with the issues of income equality, even though I am cynical about how much good can actually be accomplished through graphic means. A designer that you admire. There are so many. El Lissitzky – in many ways the father of us all –, Paul Rand, Alexey Brodovitch, Herbert Matter, Pierre Mendell, Otl Aicher, Max Huber, Richard Lohse, Albe Steiner, Bruno Monguzzi, Herbert Bayer, Jan Tschichold, Max Bill, Charles Eames, O.H.W. Hadank, Wilhelm Deffke, Max Burchartz, Anton Stankowski, A.M. Cassandre, Shigeo Fukuda, and on and on. So many! Again there are so many, but for me it is Le Corbusier. The face which is most appropriate for a particular design would be my choice. Without considering technology, what are the differences between the design from the past and the current one? I would think that the major difference in print design is that in the past work was more reductive. The designer sought to eliminate all that was unnecessary. In most contemporary design the approach is more additive. The designer thinks “what can I add”. Has the way people perceive the design changed? We are so inundated with visual messages today. It is the sheer quantity that has had a major impact on how we perceive and what we retain. I think it is more difficult to gain and hold attention today. What would you recommend to a young designer? Understand that actions, choices and decisions have consequences. Train yourself to think about and extrapolate those consequences. Think in terms of relationships and connections. Be very flexible and open. Any dogma or ‘truth’ is anathema. Consider that in today’s world everything is in beta. Things and outcomes are consequences of processes. Think more and more about process. How would you define a good design? Since design in my view is always purposeful, a good design always accomplishes its purpose and it is generally better if it does so with minimum means and effort. I think that at it’s best my work is always felt to be appropriate to the specific problem. You can almost always see that the design decisions come from the specific content of the problem. Every design decision is clearly in the service of effectively communicating that content. The work is absolutely fat-free. It is nutritious like simple whole grain bread and never like pastry. There is nothing trendy or fashionable so it does not date easily. Work done sixty years ago still look as if they were done today. There is nothing unnecessary. It is simple but, at its best, it is also poetic with the feeling perfectly fitting its subject. It is like a fitted custom tailor-made garment rather than an off the rack piece of clothing. There is no mannerism, nothing that is transferable to any other problem. It is authentically mine with a look that is uniquely mine. At its best, the ‘design’ is invisible. The cover design for the UCLA Extension program (the last work I designed) is an example that I believe demonstrates what I mean. What was your favorite game, when you were a child? During the warm summer days I always liked outdoor activity: running, jumping, climbing. In the cold winter months I preferred indoor activity with board games, such as Monopoly, checkers, chess and various card games. Thank you very much for your time and kindness. It is really a pleasure to read your answers and discover so many interesting things. I’m pleased you find it of interest and it is no trouble for me at all. Piacere! © 2013-16 Louis Danziger, Nicola-Matteo Munari. All rights reserved. We are sorry, this section is under maintenance.